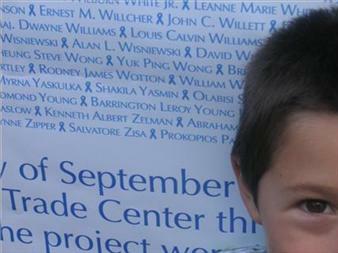 World Trade Center 5th anniversary Memorial Service in New York City, photo posted in Kennth Zelman's Guest Book. We’re just a few days away from the 10th anniversary of a day America will never forget – the attacks of September 11, 2001. At Legacy.com, we will commemorate the day in many ways: We’ll review thousands of Guest Book entries in our National Book of Remembrance and for individual victims of 9/11. We’ll post tributes on our Obit Report blog and at LegacyConnect. And here on @Legacy, we will reflect on 9/11/2001 and the anniversary with memories and thoughts for the future from voices across our company. We begin by looking just one year into the past. As the ninth anniversary of the attacks approached, this blog was brand new. When we considered the many ways we could use @Legacy to connect with our readers, one priority was clear: we would start by remembering 9/11/2001. We asked a few folks who have been around since the early days to share their memories of that day. I wrote September 11: paying tribute, in which I remembered what it was like to hear about the attacks while working at Legacy and detailed some of the work I did to help create our 9/11 memorial site. I also talked about taking my dog to the beach, which may seem a little off-topic but was how I stayed sane in those turbulent days. In September 11: building a memorial site, Greg discussed some of the nitty-gritty that went into that site, including tidbits like the origin of the flag photo that adorned its pages. Five years after the attacks, Greg took on the difficult but enormously important task of speaking to the families of victims and gathering their memories of their loved ones. Katie wasn’t yet working at Legacy.com on the day of the attacks, but that doesn’t make her contributions to our 9/11 memorial efforts any smaller or less crucial. In September 11: anniversaries and loss, she tells of one Guest Book entry – out of the thousands she has reviewed over the years for our 9/11 site – an anniversary message from a widower to his young wife, lost in the attacks. It’s a capsule of memory and grief, and it is what our remembrance site is all about. A place to grieve, to remember, and perhaps one day to heal.